India has the highest adult illiteracy rate in the world. According to the latest report published by UNESCO, there are 287 million illiterate adults in India—37 percent of the illiterate population in the entire world. India’s illiterate are far from homogenous, representing a wide spectrum of socioeconomic groups, castes, and urban vs. rural populations. Still, it’s undeniable that India’s rural areas—especially agricultural communities, frequently comprised of lower-caste individuals—face much higher rates of illiteracy than more metropolitan areas. A recent government study estimated that 32 percent of India’s rural population is illiterate, compared to 15 percent in urban areas. For farmers, that percentage may be even higher. It’s not surprising, then, that dealing with the modern challenges of agriculture proves to be difficult for many Indian farmers. Limited access to information (frequently caused by low literacy rates) directly translates into low-efficiency, low-productivty crops, trapping many farmers in a vicious cycle of poverty. Agriculture accounts for up to 18 percent of India’s GDP and employs more than half of the country’s workers. Yet agricultural communities are among the most deprived communities in the nation. Poor living conditions have been blamed for the suicides of 3,000 Indian farmers over the last three years, according to the latest figures from India’s Ministry of Agriculture. And without increasing access to education or literacy, it’s tough to imagine a change in the status quo. “For a lot of farmer families, education is still a big luxury. People cannot get educated because of financial problems, and they keep having financial problems because they are not educated,” says Dr. Vijayaragavan Vishwanathan, the son of a South Indian farmer who has beaten all the odds to become a CERN (European Organization for Nuclear Research) scientist. According to Vishwanathan, many Indian farmers still primarily pass information from generation to generation verbally, as they have for centuries. But modern factors—from evolving agricultural technology to the pressing concerns of climate change and subsequently ever-more unpredictable monsoons and irrigation levels—mean that traditional knowledge is no longer enough to prevent crops from failing. In India, groundwater availability is volatile or insufficient in many states. So systematic, up-to-date, easily accessible information about crops is more vital than ever. Vishwanathan has seen the limitation of tradition firsthand. “Back at home, we have coconut and rice fields. When I was a child, my father used to take me to the fields and explain to me everything he knew about farming. He knew a lot of things, but his knowledge was still vulnerable to changes in the soil he couldn’t predict,” he says. Despite these obstacles, as well as asymmetries among India’s urban and rural populations, India lays claim to a surprisingly high rate of mobile phone penetration. There are nearly a billion mobile phones in India today—and it has been predicted that all 1.4 billion residents will have a mobile phone by 2020. A recent report from the United Nations revealed that more Indians have access to mobile phones than toilets. “By now, everyone has a mobile phone even in the poorest villages,” says Vishwanathan. So he decided to arm today’s Indian farmers with an app designed to meet them where they’re at—illiterate and in need of a better way to track their crops. “I wanted to keep things as simple as possible, considering language and literacy issues across India,” says Vishwanathan. Vishwanathan’s “AgriApp,” SmartAgri, can be used with any mobile phone, with or without WiFi, to tackle India’s water shortage. Farmers connect their phones to a handheld device that Vishwanathan developed; when placed under the soil, the device measures and evaluates factors like moisture content, pH levels, and minerals. This information is then sent to the farmer’s mobile phone using the cloud. The information is color coded to indicate the results—green for good and red for bad—so any farmer, no matter the level of literacy, can make more targeted decisions about his or her crops. Vishwanathan represents a trend that is taking India’s booming tech world by storm. The nation’s biggest cities are now home to dozens of social enterprises that take advantage of the omnipresence of mobile phones to tackle issues experienced by farmers and other illiterate individuals. Jayalaxmi Agro Tech recently developed an app to equip low-literate farmers with information specific to their crops using audio and visual tools, which—just like SmartAgri—works just fine without an internet connection. Through this application, farmers are able to utilize highly detailed analytics to accelerate productivity—earning more money, and by extension, gaining more access to opportunities in the future. Another start-up, Janani Agriserve, provides personalized agriculture advisory services via mobile phone, updating farmers about issues concerning soil, water resources, previous crops, pest issues, current crops, and seed variety. Long-term, these types of apps have the potential to better the lives of those who use them. Despite their tight focus on the farming production process, such apps motivate users to embrace evolving communication skills and technologies by directly linking them to their livelihoods. 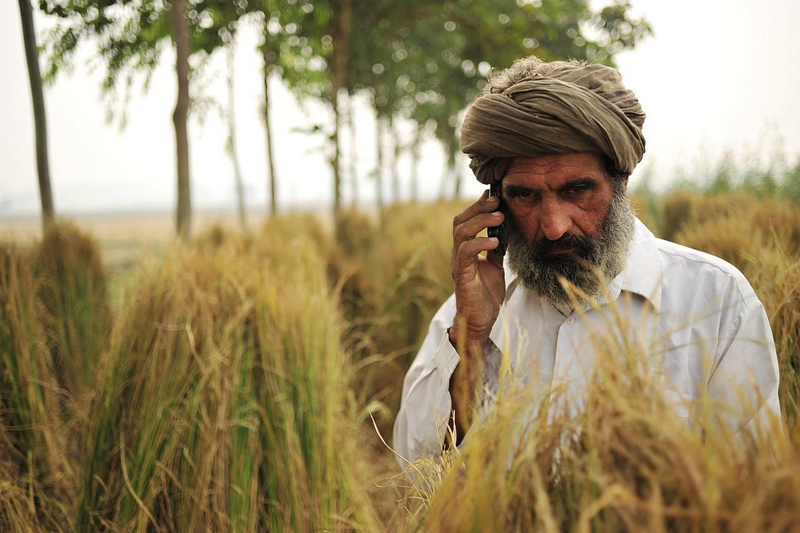 Plus, a growing number of mobile tools are being developed to help Indian farmers scale up by going online to market and sell their products. Apps like MeraKisan—which connects agricultural buyers with local farmers, thus eliminating middlemen who would reduce the farmers’ margins—are quickly gaining traction. By requiring users to have at least basic literacy skills in order to truly grow their businesses, the incentive and tools necessary to learn are right there in the hands of the farmers most in need of education. Brij Kothari, founder of PlanetRead, is well-versed in the power of omnipresent technology to organically pave the way to literacy. PlanetRead is an Indian nonprofit literacy organization centered around the concept of same language subtitling, which has used a “karaoke” method to teach reading and writing via television for over 20 years. India’s high penetration of mobile technologies in rural India could be a golden ticket to tackle its literacy issues, says Kothari. “Mobile phones are surpassing televisions. Unlike televisions, the learning from mobile phones can be a customized experience depending on a user’s needs. Even weak readers can use these technologies,” he adds. And by giving them a try, users are taking that first step toward functional literacy. “If we want to tackle literacy issues for farmers in India for the long-term and close the dent in India’s literacy, we should target the young generation who will be the farmers of the future,” says Kothari. And because future farmers can watch their role models take advantage of current technologies to better their circumstances, a more literate future is even likelier. “Everything will accelerate in 20 years,” Kothari says—he’s certain of it. This article appeared on GOOD Magazine.